This is an official pass as logged on the government maps, but when you drive it, you will wonder which cartographer had the courage to name this road a pass as there is very little that resembles a real mountain pass, other than it's vertical profile. Despite its very long length of 18,7 km and a respectable altitude variance of 286m, it only has 10 bends, corners and curves and none of them exceeds 30 degrees radius. What you will enjoy is a feeling of remoteness in the dense Addo bush and the possibility of spotting game. This pass will only be driven by the more serious pass enthusiast. The usual Eastern Cape cautionaries apply of corrugations, and loose gravel on corners as well as livestock and pedestrians on the road. All Saints Neck is located on the outskirts of Engcobo (also sometimes spelled as Ngcobo), a small town in the Eastern Cape between Queenstown and Mthatha on the R61. The pass is named after the All Saints mission station, which was founded in 1860 and which is located to the north of the pass, about 8 km from the town. The road has been refurbished and upgraded and is in an excellent condition, but as always in the Eastern Cape, care must be exercised when driving this pass due to the abundance of traffic, pedestrians and animals in the roadway. This minor, but scenic poort is located on the tarred N6 route between Queenstown and Jamestown. It's only 2,7 km long and displays an altitude variane of just 18m producing a very easy average gradient of 1:150. The typical poort statistics allow the traveller to relax and enjoy the wonderful country scenery. 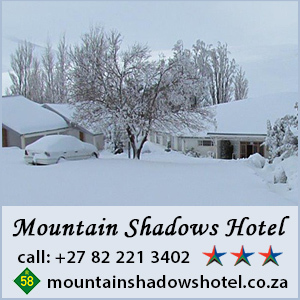 The poort is suitable for all vehicles and on the odd occassion snow can be encountered. The road is in excellent condition with safety shoulders, but be aware that this is a fairly busy road and it carries large volumes of traffic. This is not a lazy Sunday afternoon drive. This rough, steep gravel pass crosses the Grootrivier on the northern side of the Baviaanskloof Mountains via a river crossing just below a weir, without a bridge. Whilst the pass itself is a mere 5 km long, it is the access roads which make the driving of this pass, something of an adventure. First things first - You will not be able to drive this pass without being in a 4x4 vehicle with good ground clearance. 'Soft-roaders' will not have sufficient ground clearance. Adventure bikers will need to be experienced to handle this road, as it is long, rough, steep and dangerous over many sections, including the entire eastern section between the pass and Patensie. This very scenic pass is located on a minor gravel road - the P3222 - that connects farms in the Wartrail and New England areas with Rhodes and the R393 in the east and Barkly East and the R58 main road in the west. It has an unusual inverted vertical profile with a steep drop down into a valley bisected by a river, followed by a climb up the eastern side, which is a false summit. Despite it being a remote country road, the pass is well designed and has fairly easy gradients of 1:10 and higher. It will always be driven in tandem with the Wintersnek Pass a few kilometres further to the west. The pass is suitable for all vehicles in fair weather, but like all gravel roads, it can deteriorate rapidly in heavy rain or snow conditions. This is a fairly safe, high altitude gravel pass located about 15 km north-east of Indwe in the Eastern Cape. It is located on the R396 which connects with the R56 in the south and the tiny village of Rossouw in the north. The pass is of average length (4,9 km) but it does descend incessantly, producing a stiff average gradient of 1:14. Some of the steeper sections present at 1:6. With an altitude of 1786m the pass is subject to regular winter snowfalls. In snow conditions, it is best avoided entirely. In fair weather the pass can be driven in a normal car. There's a strong similarity between this pass and the nearby Greylings Pass, except this one is on a much grander scale. The pass is also known as the Nepgen Pass or the Waschbank Pass. (More history on this lower down this page). The Bastervoetpad Pass is one of the most challenging true mountain passes in South Africa and it's rated high amongst the Top 8 high altitude passes of the Eastern Cape. Officially named the Dr. Lapa Munnik Pass, (although no-one uses this name), this rough gravel pass is located between the summit of the Barkly Pass and Ugie and traverses a southern arm of the Drakensberg along the east-west axis. The rugged mountains and deep, green valleys of the southern Drakensberg are strongly reminiscent of the Scottish Highlands, with icy winters and mild summers. This is the only pass in South Africa named after a minister of Public Health. The route was first discovered in 1862 by Adam Kok lll, when he led an armed group down the footpath as a possible route for his historic trek, but found the locals too hostile. He subsequently led the Griquas in their historic trek from Phillipolis in the Free State to their new home, called of course - Kokstad, over another route further to the east, named Ongeluksnek. The pass boasts a summit height of 2240m, a length of 20 km and it loses 830m of altitude down the Drakensberg escarpment on the eastern side. Add to those rather impressive statistics, this pass can be treacherous in bad weather and is subject to electrical storms, violent winds, heavy rain, hail and snow. It also offers some of the finest scenery in South Africa, when the weather is good. If you intend driving this pass, watch all six videos first and then make your decision. Please note that you need a 4x4 vehicle with low range & high ground clearance to complete this pass. The Baviaans-Kouga 4x4 route is a Grade 2/3 4x4 route starting (unofficially) at the turnoff on the tarred R62, one km east of Kareedouw and ends some 70 km further north at the Doringkloof farmstead in the Western Baviaanskloof. The 4x4 section officially starts at the neck at the final descent to the Baviaans Lodge. If you are new to the Baviaanskloof, we recommend first watching the Orientation & Overview video.